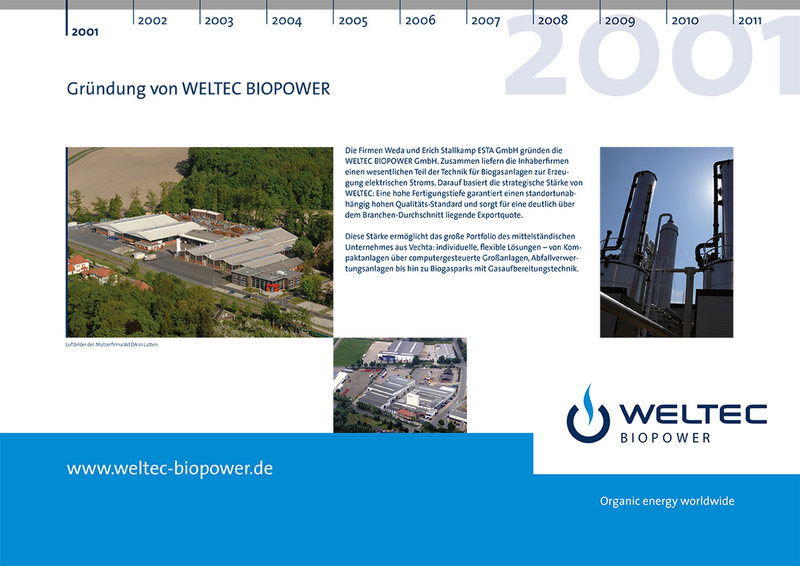 Since the foundation of WELTEC BIOPOWER in 2001, the company has continued to develop. Thanks to the innovative power of all WELTEC employees, we are always in a position to offer optimal biogas technologies. WELTEC is in demand worldwide: A special order comes from Uruguay. There, a biogas plant with a heat output of more than six megawatts will be built by WELTEC. In addition, WELTEC was honored with two ADBA awards for its successes abroad and was pleased to receive a top 5 ranking at the Lower Saxony Foreign Trade Award. With the introduction of Kumac, the slurry and digestate processing technology, WELTEC wants to counteract the rising pressure of nutrient excess. The construction of an anaerobic stage at a wastewater treatment plant in Bavaria will open up another business area. 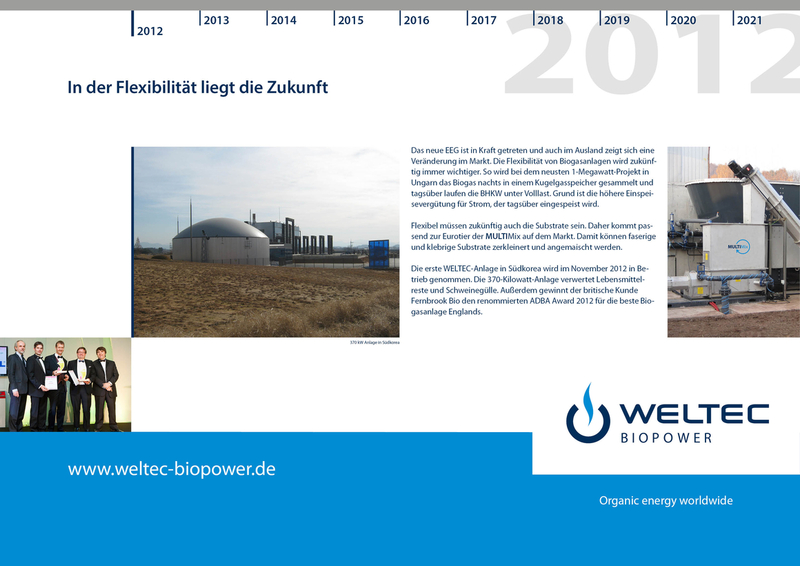 The WELTEC Group is growing: The biomethane plant in Ebsdorfergrund (Hesse) can be taken over. 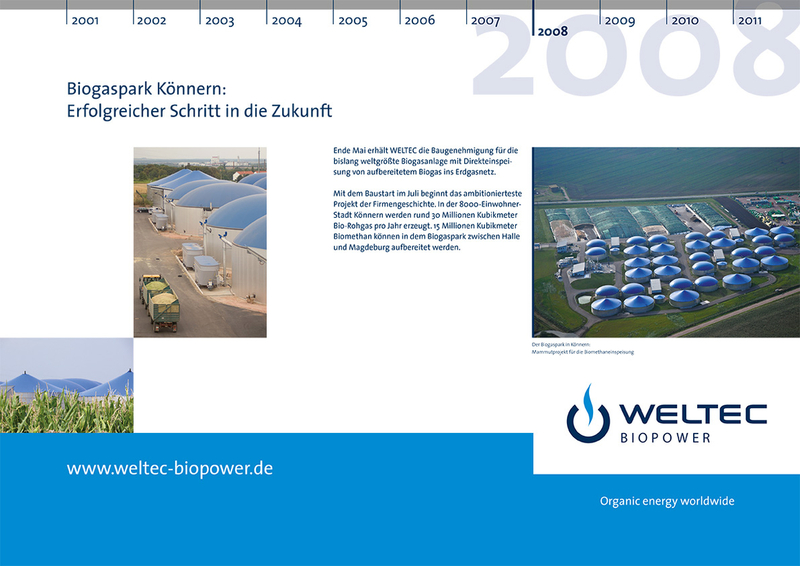 In addition, the biogas parc in Könnern is repurchased. With the order from Australia, WELTEC is also conquering the fifth continent in its history. The first WELTEC plant on the South American continent is being built: The biogas plant in Uruguay is convincing with a special overall concept. 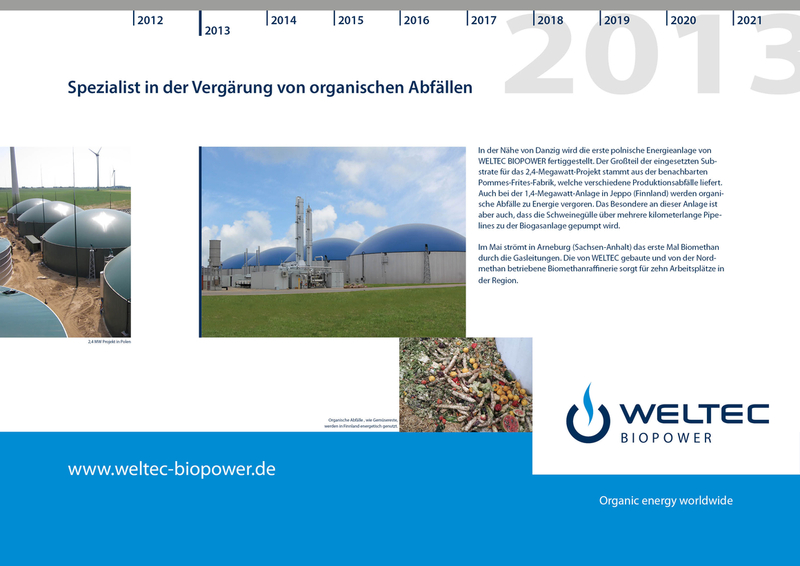 Individual plant concepts for waste-to-energy AD plants are a special area of WELTEC. Customers in Poland and Finland also appreciate this. 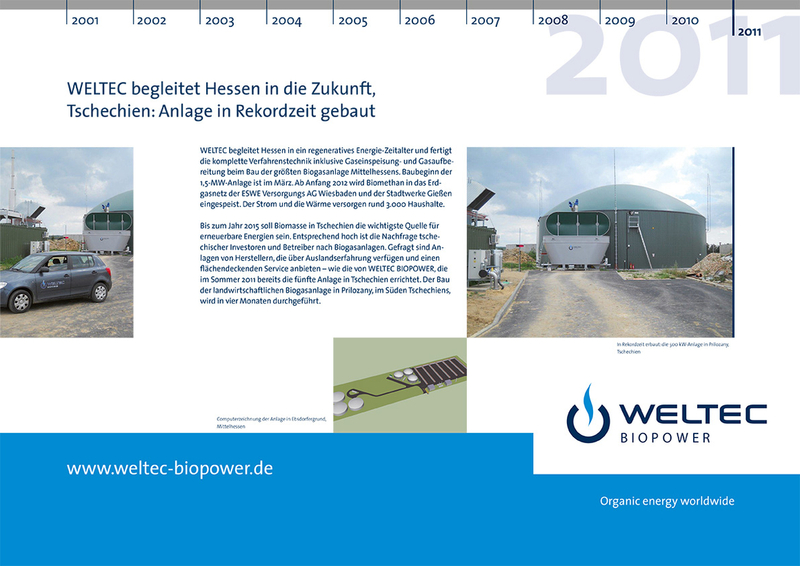 But also in Germany a new plant is built: The biomethane plant in Arneburg is completed. WELTEC BIOPOWER has completed its first AD plant in South Korea and has developed four new countries this year. The MULTIMix is also laucnhed. The liquid input system comminutes fibrous input materials and thus allows a wide range of substrate applications. Demand in the Czech Republic is on the rise. 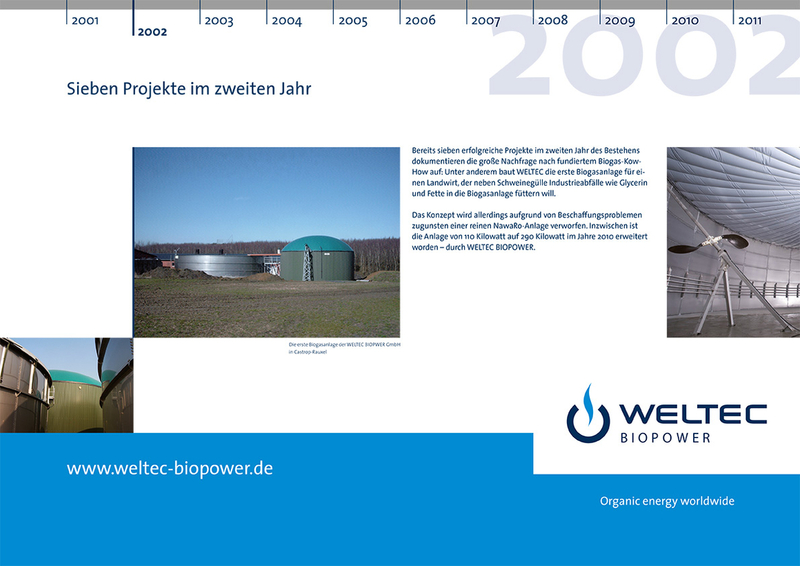 One plant can be commissioned by WELTEC after a record building time of only four months. 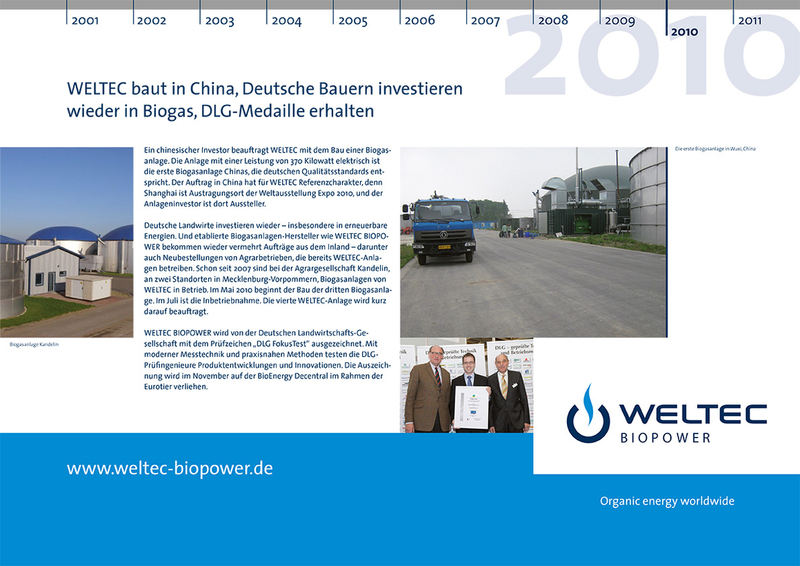 The German Agricultural Society (DLG) awarded WELTEC with the "DLG Fokus Test" for excellent plant performance. 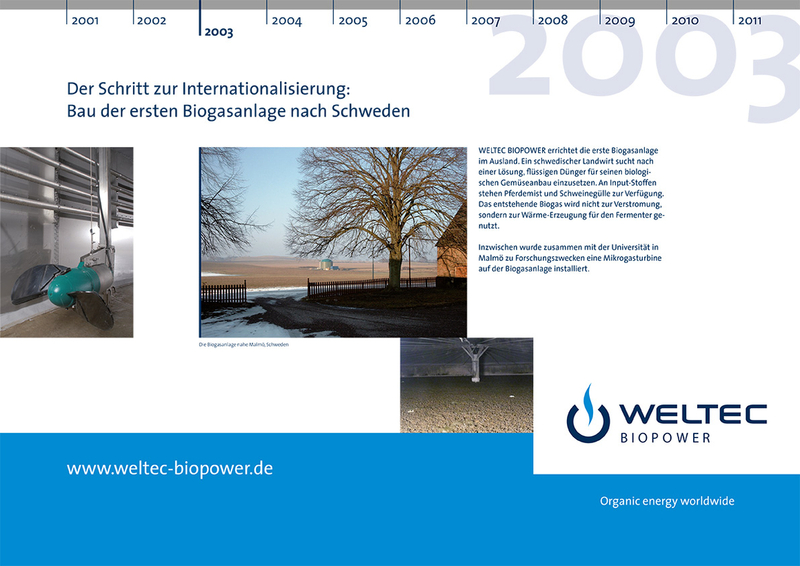 Foundation of British subsidiary WELTEC BIOPOWER (UK) Ltd. In addition, WELTEC is one of the first plant builders to receive ISO certifications 9001 and 14001. 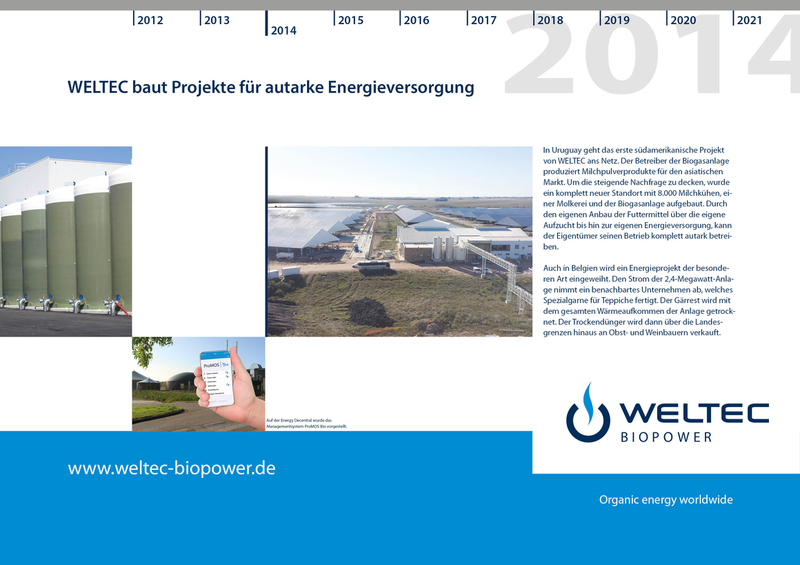 WELTEC BIOPOWER receives the building permit for the by the time world's largest biogas plant with direct feed into the natural gas network. 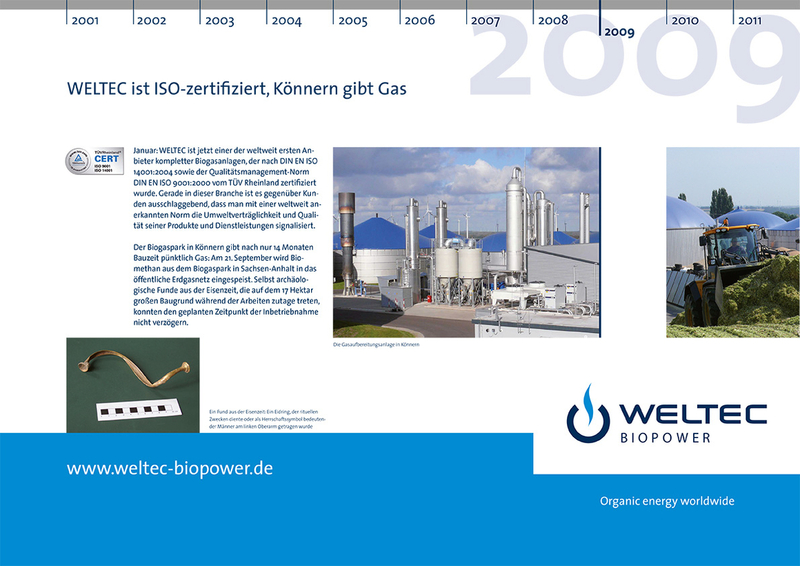 The plant in Könnern is today an important sign of the biogas plant manufacturer. 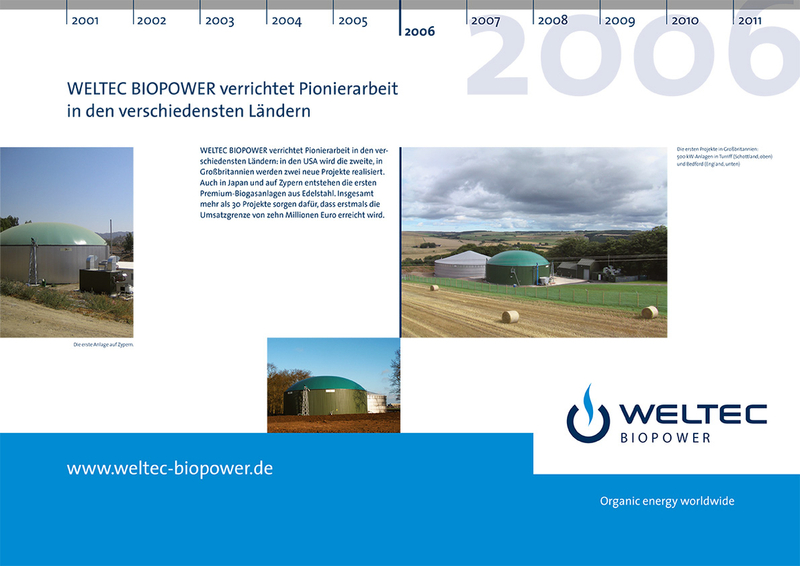 About 40 plants are being erected throughout Europe by WELTEC in 2007. More and more countries are added to the reference map. The subsidiary AMBICO (USA) and the partner company WELTEC BIOPOWER ME s.r.o. (Czech Republic) are established. Due to the growth, WELTEC moves from Lutten to Vechta. 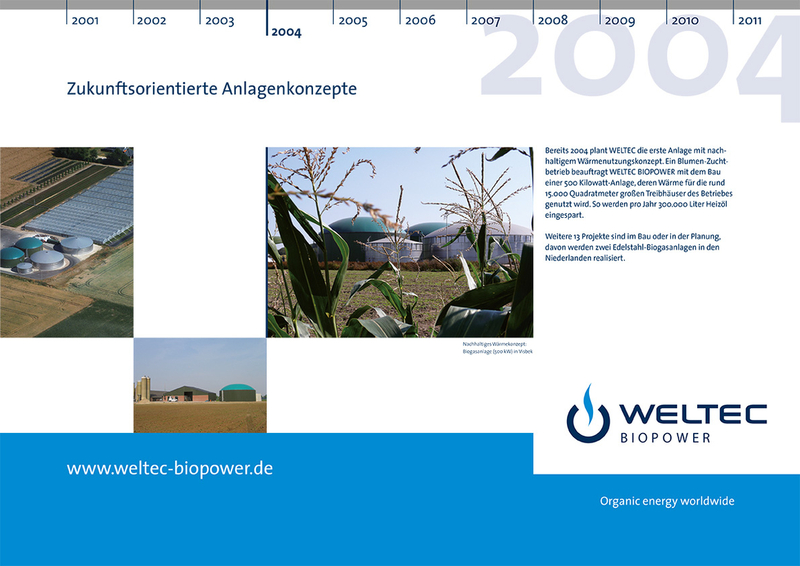 Biogas reaches the UK: WELTEC is building two of the fifteen very first plants on the island state. The early market entry proves to be groundbreaking. The United Kingdom will become one of the most important markets in the coming years. 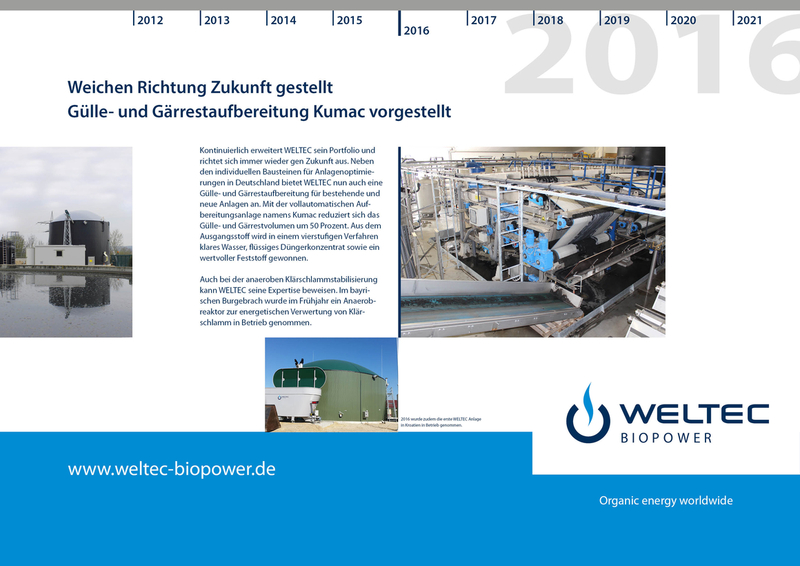 Boom in Germany: Nearly 30 plants are being built by WELTEC in 2005. At the same time, the biogas specialist enters the US market. WELTEC is planning a plant with a very special heat concept. A flower breeding company builds a biogas plant to supply its greenhouses with heat. The first step towards internationalization: planning and construction of the first WELTEC plant in Sweden. 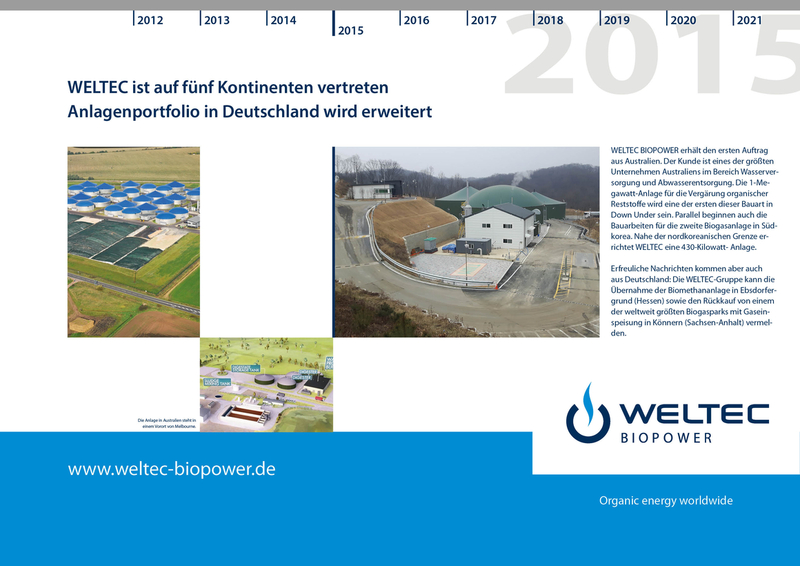 The demand for biogas plants in Germany is on the rise: already seven projects can successfully commissioned in the second company year. 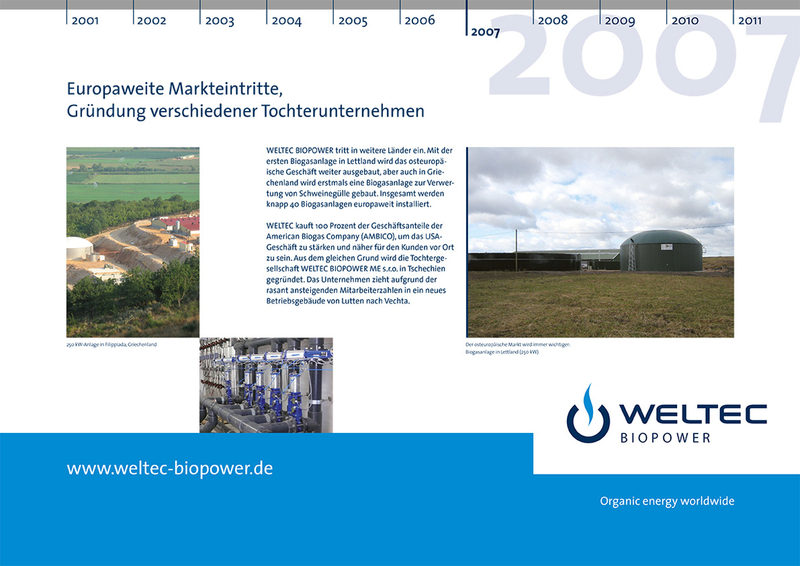 WELTEC BIOPOWER GmbH was founded by the companies Stallkamp and WEDA on July 1, 2001. The aim is to provide individual and flexible solutions for the agricultural, waste and wastewater sectors worldwide. Organic energy worldwide.